The certificate following the certificate format naming convention. Key Id is opaque name component to identify an instance of the public key for the certificate namespace. The value of Key ID is controlled by the namespace owner. The library includes helpers for generation of key IDs using 8-byte random number, SHA-256 digest of the public key, timestamp, and the specified numerical identifiers. Issuer Id is opaque name component to identify issuer of the certificate. The value is controlled by the issuer. The library includes helpers to set issuer ID to a 8-byte random number, SHA-256 digest of the issuer's public key, and the specified numerical identifiers. Key Name is a logical name of the key used for management pursposes. Key Name includes the certificate namespace, keyword KEY, and KeyId components. Definition at line 81 of file certificate.hpp. Definition at line 48 of file certificate.cpp. Construct certificate from a data object. Definition at line 53 of file certificate.cpp. References ndn::tlv::ContentType_Key, ndn::Data::getContent(), ndn::Data::getContentType(), ndn::Data::getFreshnessPeriod(), ndn::Data::getName(), and isValidName(). Definition at line 70 of file certificate.cpp. Construct certificate from a wire encoding. Definition at line 75 of file certificate.cpp. Definition at line 81 of file certificate.cpp. References ndn::Data::getName(), ndn::Name::getPrefix(), and KEY_ID_OFFSET. 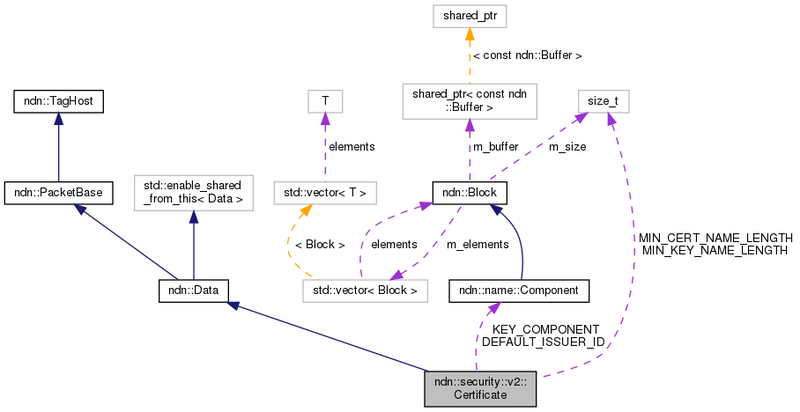 Referenced by ndn::security::pib::CertificateContainer::add(), ndn::security::pib::PibMemory::addCertificate(), ndn::security::pib::PibSqlite3::addCertificate(), ndn::security::v2::KeyChain::addCertificate(), ndn::security::v2::KeyChain::exportSafeBag(), ndn::security::v2::KeyChain::importSafeBag(), and ndn::security::v2::operator<<(). Definition at line 87 of file certificate.cpp. References ndn::Data::getName(), ndn::Name::getPrefix(), and KEY_COMPONENT_OFFSET. Referenced by ndn::security::pib::PibMemory::addCertificate(), ndn::security::pib::PibSqlite3::addCertificate(), ndn::security::v2::KeyChain::exportSafeBag(), and ndn::security::v2::KeyChain::importSafeBag(). Definition at line 93 of file certificate.cpp. References ndn::Name::at(), ndn::Data::getName(), and KEY_ID_OFFSET. Definition at line 99 of file certificate.cpp. References ndn::Name::at(), ndn::Data::getName(), and ISSUER_ID_OFFSET. Definition at line 105 of file certificate.cpp. Referenced by ndn::security::v2::KeyChain::importSafeBag(), and ndn::security::v2::operator<<(). Get validity period of the certificate. Definition at line 113 of file certificate.cpp. References ndn::Data::getSignature(), ndn::Signature::getSignatureInfo(), and ndn::SignatureInfo::getValidityPeriod(). Referenced by ndn::security::v2::CertificateCache::insert(), and ndn::security::v2::operator<<(). Check if the certificate is valid at ts. Definition at line 119 of file certificate.cpp. References ndn::Data::getSignature(), ndn::Signature::getSignatureInfo(), ndn::SignatureInfo::getValidityPeriod(), and ndn::security::ValidityPeriod::isValid(). Get extension with TLV type. Definition at line 125 of file certificate.cpp. References ndn::Data::getSignature(), ndn::Signature::getSignatureInfo(), and ndn::SignatureInfo::getTypeSpecificTlv(). Check if the specified name follows the naming convention for the certificate. Definition at line 131 of file certificate.cpp. References ndn::Name::get(), KEY_COMPONENT, KEY_COMPONENT_OFFSET, MIN_CERT_NAME_LENGTH, and ndn::Name::size(). 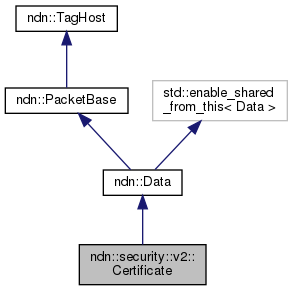 Referenced by Certificate(), ndn::security::v2::KeyChain::deleteCertificate(), ndn::security::v2::extractIdentityFromCertName(), ndn::security::v2::extractKeyNameFromCertName(), ndn::security::pib::CertificateContainer::get(), and ndn::security::pib::CertificateContainer::remove(). Definition at line 166 of file certificate.hpp. Definition at line 167 of file certificate.hpp. Definition at line 168 of file certificate.hpp. Referenced by ndn::security::v2::extractIdentityFromCertName(), getIdentity(), and isValidName(). Definition at line 169 of file certificate.hpp. Referenced by ndn::security::v2::extractKeyNameFromCertName(), getKeyId(), and getKeyName(). Definition at line 170 of file certificate.hpp. Definition at line 171 of file certificate.hpp. Referenced by ndn::security::v2::extractIdentityFromKeyName(), and ndn::security::v2::isValidKeyName(). Definition at line 172 of file certificate.hpp. Referenced by ndn::security::v2::constructKeyName(), ndn::security::v2::isValidKeyName(), and isValidName().